BETHLEHEM (Ma’an) — Israeli settlers from the illegal Beitar Illit settlement raided Palestinian lands in the village of Wadi Fukin in the central occupied West Bank district of Bethlehem on Tuesday, according to local witnesses.Ahmad Sukkar, head of the Wadi Fukin village council, told Ma’an that a group of Israeli settlers raided agricultural lands in the al-Fuwwar area of the village, destroying two greenhouses and tearing up plants belonging to Maher Sukkar, Jamil Assaf, and Muhammad Manasra.Sukkar also said the Israeli settlers uprooted the plants of Muhammad Saleh Manasra and Naim Daoud Attiyeh, before spray-painting “Death to Arabs” on their property.Israeli settlers from the illegal Beitar Illit settlement, which has been built on private Palestinian lands belonging to the villages of Husan, Nahalin, and Wadi Fukin, commonly raid the communities and destroy Palestinian property.Beitar Illit is one of several settlements that comprise what Israel refers to as the “Gush Etzion” settlement bloc, which Israel plans to illegally annex into its territory, according to the Applied Research Institute – Jerusalem (ARIJ).According to ARIJ, Israel’s plans of incorporating the Gush Etzion settlement bloc into the municipal boundaries of Jerusalem — boundaries that Israel continuously redefines in order to annex land further into Palestinian territory — parallels with Israel’s objectives of reshaping the demographics of the city by lowering the Palestinian population to 20 percent, and filling in the rest with Jewish Israelis.Local Palestinians often attribute settler attacks on Palestinian communities — 51 of which have been reported since the start of this year, according to UN documentation — to Israel’s larger goals of depopulating Palestinian villages near settlements by scaring Palestinians into leaving their lands in an attempt to make room for the expansion or connection of the illegal settlement blocs. While the Israeli government does not make Israeli settler population statistics public, most rights groups agree that some 600,000 settlers reside in Israeli settlements across the West Bank and East Jerusalem — all of which are considered illegal under international law. GAZA, (PIC)– The Egyptian authorities on Wednesday morning opened the Rafah border-crossing for five days before stranded Gazans. A PIC reporter said hundreds of stranded Palestinians and humanitarian cases flocked to the border-crossing to gain access out. The Egyptian authorities have exceptionally opened the Rafah passageway for the fourth time since the start of 2016. The border-crossings and borders committee called on the Palestinian passengers to follow the recommended travel tips so as to ensure safety. The Egyptian authorities have been closing the Rafah border-crossing since 2007, blocking Gazans’ movement in and out except for a few days and over intermittent intervals. Dozens of sick Gazans died as they failed to gain access out of the crossing for urgent treatment in foreign hospitals while others lost their works due to the same reason. Furthermore, many Gazan students could not travel to join their universities. Gaza, (PIC)– Mizan Center for Human Rights warned of the fact that Israeli occupation forces use the crossings for blackmailing and arresting sick people of Gaza Strip. Sick people are left deprived of accessing hospitals through Beit Hanoun crossing by refusing or stalling the issuance of passage permits. The Center pointed out in a statement on Tuesday that a sick citizen and two escorts of other patients were arrested at the crossing. The statement considered their arrest as violation of the international humanitarian law and paragraph 2 of article 38 of Fourth Geneva Convention which obliges Israeli authorities to provide citizens under occupation with medical treatment and health care at hospital. The Center also added that Israeli occupation violates human rights standards stipulated for in articles 22 and 25 of the Universal Declaration of Human Rights and article 12 of the international charter of the economic, social and cultural rights. GAZA, (PIC)– The Israeli occupation destroyed Palestinian lives in the blockaded Gaza Strip, the United Nations Chief Ban Ki-moon said Tuesday. “I am honored to be in Gaza once again,” said the U.N. Chief during a press conference in Gaza. “The Palestinians in Gaza have a very special place in my heart.” “I have personally witnessed the ravages of war and have been profoundly moved by the resilience and determination of the Palestinian people. They have stood up and rebuilt their lives in the face of staggering obstacles and hardships,” he added. “I just had the privilege of visiting a rehabilitation hospital generously donated by the government of Qatar. I thank all donors for their support in the reconstruction effort,” Ban Ki-moon stated. “But so much more needs to be done. We can help rebuild houses. But can we rebuild lives? Can we help those who have suffered the terror of war deal with the deep scars that violence leaves behind? Can we ensure that accountability is upheld and the victims of conflict feel a profound sense of justice?” the U.N. Chief wondered. “Can we create jobs and prosperity so that peace is sustainable?” “I know what it is to live as a displaced person on the move with no home, in fear for your life and your own future,” the statement further read. “I stand with the people of Gaza to say that the United Nations will always be with you,” he vowed. “They are enduring enormously difficult living conditions. The closure of Gaza suffocates its people, stifles its economy and impedes reconstruction efforts. It is a collective punishment for which there must be accountability,” said Ban Ki-moon as he slammed the tough Israeli siege on Gaza. “Today, some 70 percent of the population is in need of humanitarian assistance, and over half of Gaza’s youth have little to no job prospects or horizons of hope,” he added. In Ki-moon’s terms “this situation cannot continue” for “it feeds anger and despair” and “increases the danger of a new escalation of hostilities, which can only bring further suffering to the people of Gaza.” “We need to speak openly of the challenges and the unacceptable difficulties that the people of Gaza face; of the humiliation of the occupation and the closures, but also of the division between Gaza and the West Bank,” he added. “The United Nations will continue to work for a future without occupation and oppression; with dignity and democracy,” he further pledged. GAZA, (PIC)– Palestinian MP and head of the popular anti-siege committee, Jamal al-Khudari, called Tuesday for translating the promises released by the United Nations Chief into action. Al-Khudari called on the U.N. to opt for practical steps to lift the Israeli siege on Gaza. “Words remain up in the air if they do not culminate in practical action,” said al-Khudari. “Israel will never give up its aggressive policies and tough blockade in Gaza, the West Bank, and Jerusalem as long as the international community remains passive,” he added. “All Israeli practices go against international laws and treaties,” said al-Khudari. “The Palestinians are eager to restore their freedom, end the Israeli occupation, and establish an independent Palestinian state with Jerusalem as its capital,” he further stated. “The world’s free people should help us make our dream come true.” The U.N. Chief vowed on Tuesday during a stopover in Gaza to stand by the Palestinians and try every possible endeavor to alleviate the destructive effects of the tough Israeli siege imposed on the coastal enclave for the 10th year running. Palestinian prisoner Bilal Kayed, on his 14th day of hunger strike, was transferred on Monday, 27 June, from isolation in Ramon prison to isolation in Ahli Kedar prison in Beersheba. Isolation and transfers are frequently used by the Israeli prison administration in order to undermine prisoner protests, including hunger strikes. Kayed launched his strike on 14 June after being ordered to six months’ administrative detention upon the expiration of his 14.5 year sentence in Israeli prison on 13 June. His comrades in the Popular Front for the Liberation of Palestine and Palestinian prisoners across political lines have been participating in escalating steps of protest within the prison, including hunger strikes, demanding Kayed’s freedom. Among them are 11 prisoners in Jalameh prison, who have been hunger striking for one week in solidarity with Kayed; their lawyer, Jalal Abu Wasel, noted the poor conditions in the jail, which is provided with security equipment by multinational security corporation G4S, including poor hygiene, insect infestation, and intolerable heat. Kayed’s case is seen as threatening a dangerous precedent of imprisoning Palestinian prisoners indefinitely following the expiration of lengthy sentences. Hundreds of Palestinian prisoners are participating in hunger strike protest actions demanding Kayed’s freedom. The PFLP affiliated prisoners have announced they will join Kayed in a full open-ended hunger strike in early July should he remain imprisoned. A military court hearing to confirm Kayed’s administrative detention was postponed until 6 July after he refused to attend or participate in the scheduled hearing last week, declaring that the court and process has no legitimacy. There are over 700 administrative detainees in Israeli jails, held without charge or trial on the basis of secret evidence. Administrative detention orders, issued for one to six month periods, are indefinitely renewable. People around the world have participated in protests to free Kayed, as thousands have taken to the streets in Palestine to demand his release. AL-QAA, Lebanon — A wave of suicide bombings targeted the Lebanese Christian town of al-Qaa, which borders Syria, on June 27. In the early hours, four suicide bombers detonated their explosive belts, followed in the late evening by four other suicide bombings. The attacks are an indicator of attempts by Syrian terror organizations such as Jabhat al-Nusra and the Islamic State (IS) to break the siege imposed on them by Lebanese intelligence and security services. These attacks could also further fuel sectarian tensions in an area where the fallout of the Syrian conflict has created deep divisions across religious communities. When Shadi Mkaled, an al-Qaa resident, woke up to eat breakfast before beginning his day of fasting, little did he know he would find himself face to face with four suicide bombers en route for an unknown destination. According to a recording of the army’s interview with Mkaled, provided by an officer in the Lebanese military intelligence to Al-Monitor, he heard a noise in the garden at around 4 a.m. The family walked out to find four disheveled men who pretended to belong to the Lebanese army intelligence. Suspecting foul play, Mkaled takes out a weapon and fires at one of them, who blows himself up. Roused by the blast, local residents and Lebanese army soldiers ran to the site of the explosion, clashing with the other three suicide bombers, who detonated themselves subsequently at 10-minute intervals. “One rescue worker [Boulos Ahmar] who was trying to carry a wounded man was killed after the second suicide bomber detonated his explosive belt,” Shawki Toom, al-Qaa mukhtar (village head), told Al-Monitor. “Al-Qaa was the intended target of the [first] quadruple bombings, which resulted in the death of nine people, including the suicide bombers, and injured 15 others. We still have no information on the attackers’ nationality,” al-Qaa Mayor Bashir Mattar told Al-Monitor. The deadly spate of bombings resumed a few hours later at around 10 p.m. when four other suicide bombers targeted the central square of the town, a Lebanese army outpost and another manned by intelligence services, an officer in the army’s counterterrorism unit told Al-Monitor. According to Toom, six more people were injured, one critically. Al-Qaa security incidents can be better understood through a geographic lens. The town is of strategic importance as it is a gateway between Syria and Lebanon, sitting on the borders of a large agricultural region called Masharih al-Qaa (Qaa Projects), used as a smuggling route by traders of all sorts and rebels after the Syrian revolution. Since the Syrian conflict erupted in 2011, al-Qaa’s mountainous area has been rocked by clashes and shelling pitting rebels — and later radical groups — against the Lebanese army. In August 2014, the army clashed with IS and Jabhat al-Nusra, al-Qaeda’s affiliate in Syria, in the border town of Arsal, a few kilometers from al-Qaa. During the battles, IS and Jabhat al-Nusra kidnapped 30 Lebanese soldiers and policemen, 16 of whom were released after 1½ years of negotiations. The borders are now cordoned off on one side by the Syrian army and on the other by the Lebanese army through the mountain area of Jaroud Qaa and Jaroud Ras Baalbek, up to the town of Arsal. But behind the mountains, terror organizations still roam free. “We still have not identified the faction behind the bombing,” the officer in the Lebanese intelligence said. “But we believe the bombers came from Syria and not from the border area of Masharih al-Qaa, which is under tight surveillance,” he added. Lebanon’s army has fought off jihadi factions along the frontier and has sought to clamp down on local cells operating in the area, arresting several cells in recent months, according to municipal and military sources Al-Monitor spoke with. “Al-Qaa was definitely not initially the target,” said the Lebanese army officer, who appears to disagree with the opinion of the town’s mayor. “The number of suicide bombers who seemed well trained makes us believe they were destined for a larger operation. They were most probably waiting for a transporter who would smuggle them out of al-Qaa and provide them with fake identity cards enabling them to reach another destination — possibly the cities of Baalbek or Hermel [two Hezbollah bastions] or even Beirut,” he said. This opinion is also shared by the counterterrorism officer who explained that the second cell responsible for the nighttime attacks probably got stuck in al-Qaa, with its members blowing themselves up after the village was encircled by the army. “They were unable to reach the army positions to detonate themselves, which explains the low number of casualties in the evening,” the officer said. The high casualty count incurred during the bloody day will nonetheless put pressure on already strained relations between the Christian village and Syrian refugees residing in Masharih al-Qaa. According to Toom, there were already tensions between al-Qaa residents and the refugees who illegally occupy agricultural land owned by the town’s residents. “This could increase sectarian tensions — it is a dangerous turn of events,” Mattar said. According to the municipality, roughly 30,000 Syrian refugees reside in Masharih al-Qaa. The sectarian fires started by the bombings also threaten to reach the broader Lebanese social landscape in the Bekaa Valley. The region of al-Qaa, Ras Baalbek, Arsal, Labweh and Baalbek is home to Christians, Sunnis and Shiites. Since the Syrian revolution, a growing feeling of resentment has been experienced by the people in al-Qaa toward neighboring Sunni Arsal and the Syrian refugees in Arsal. The residents of these areas view the Syrian war from opposite ends of the spectrum. Sunnis and Syrian refugees side with Syrian rebels, while the majority of al-Qaa residents see them as terrorists. Complicating the picture is the vicinity of Shiite villages whose residents widely support Hezbollah, which is fighting alongside the regime of Syrian President Bashar al-Assad. According to the former mayor of al-Qaa, Saadeh Toum, other reasons are also rooted in the past: Al-Qaa residents have accused Arsal residents of exploiting Masharih al-Qaa illegally since 1975. “Al-Qaa projects are mostly owned by al-Qaa residents but are farmed illegally by Arsal villagers, which has resulted in ongoing land disputes,” Toum explained in a previous interview two years ago. According to local sources, the Lebanese government earmarked $12 million to define the land and determine true ownership — a process that never came to fruition. As al-Qaa residents lick their wounds in the wake of the eight deadly suicide bombings, Lebanon is struggling with its manifold repercussions that could engulf Lebanon in a new phase of uncertainty. But little is expected from the Lebanese government, which has been marred by paralysis in one of the worst institutional crises since the end of the war. RAMALLAH, (PIC)– Israeli confiscation policy has notably escalated in occupied Jerusalem and West Bank by 439% since the beginning of 2016 in comparison to last year, a Palestinian report revealed Tuesday. Applied Research Institute – Jerusalem (ARIJ) revealed in a report issued Tuesday that Israeli authorities confiscated since the beginning of the year 7,773 acres of Palestinian-owned lands, recording an increase by 439% in comparison with last year where 1,442 acres were seized. The Israeli occupation authority has recently escalated its Judaization policy in the West Bank notably by expanding its settlement projects, the report pointed out. During the reporting period, Israeli occupation forces demolished 276 Palestinian homes in the West Bank including East Jerusalem while 108 homes were destroyed during 2015. 343 agricultural facilities were also destroyed during the first half of 2016 while 59 Palestinian facilities were demolished during the same period last year. ARIJ revealed that the IOA started building 139 using units last May in Shiloh illegal settlement as part of a big project to expand 10 new settlements. 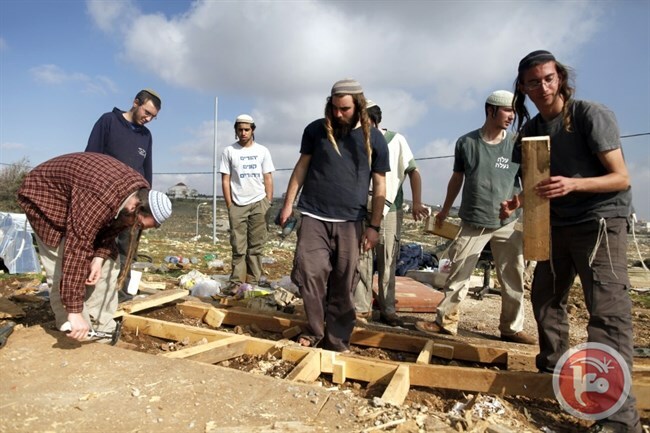 Although Israeli authorities do not make settlement population statistics public, the Applied Research Institute – Jerusalem has reported a population of some 766,000 Israeli settlers residing in illegal settlements scattered across the occupied West Bank and Jerusalem. All Israeli settlements on Palestinian land are considered illegal under international law. After vehemently denying that it had anything to do with the water crisis in the West Bank, Israel has finally admitted that it was the culpable party after all. Entire communities in the West Bank either have no access to water or have had their water supply reduced by almost half. This alarming development has been taking place for weeks, since Israel’s national water company, Mekorot, decided to cut off — or significantly reduce — its water supply to Jenin, Salfit and many villages around Nablus, among other regions. For weeks, Mekorot took no responsibility for the dire situation in the West Bank, but after liberal Israeli newspaper, Haaretz, looked into the matter, it managed to obtain an Israeli admission. Worse still, “Palestinian Water Authority officials told Haaretz that people at Mekorot have told them the supply cuts were going to last the entire summer,” the Israeli daily reported. “Israel has been ‘waging a water war’ against Palestinians”, was the statement made earlier by Palestinian National Authority Prime Minister, Rami Hamdallah. The irony is that the water provided by Mekorot is actually Palestinian water, usurped from West Bank aquifers. While Israelis, including illegal West Bank colonists, use the vast majority of it, Palestinians are sold their own water back at high prices. By shutting down the water supply at a time that Israeli officials are planning to export essentially Palestinian water, Tel Aviv is once more utilising water as a form of ‘collective punishment’. This is hardly new. It was an Israeli government strategy that has been in use for decades, but was mastered mostly during the first Palestinian intifada or uprising, which had erupted in 1987 throughout the Occupied Palestinian Territories. Whenever clashes erupted between the Israeli army and stone-throwing children, one of the initial actions carried out by the Israeli Civil Administration — a less ominous title for the offices of the Israeli occupation army — was to collectively punish the entire population of whichever refugee camp rose up in rebellion. The steps the Israeli army took became redundant, although they grew more vengeful with time: A strict military curfew (meaning the shutting down of the entire area and the confinement of all residents to their homes under the threat of death), cutting off electricity, and shutting off the water supply. Of course, these steps were taken only in the first stage of the collective punishment, which lasted for days or weeks, sometimes even months, pushing some refugee camps to the point of starvation. Since there was little the refugees could do to challenge the authority of a well-equipped army, they invested whatever meagre resources or time that they had to plot their survival. Hence, the obsession over water, because once the water supply ran out, there was nothing to be done; except, of course, that of Salat Al-Istisqa or the ‘Prayer for Rain’ that devout Muslims invoke during times of drought. In fact, more Palestinians have been conducting their prayer for rain since 1967 than at any other time. In that year, almost exactly 49 years ago, Israel occupied the two remaining regions of historic Palestine: the West Bank, including East Jerusalem, and the Gaza Strip. And throughout those years, Israel has resorted to a protracted policy of ‘collective punishment’: Limiting all kinds of freedom of Palestinians, and using the denial of water as a weapon. Indeed, water was used as a weapon to subdue rebelling Palestinians during many stages of their struggle. In fact, this history goes back to the war of 1948, when Zionist militias cut off the water supply to scores of Palestinian villages around occupied Jerusalem to facilitate the ethnic cleansing of that region. During the Nakba (or Catastrophe) of 1948, whenever a village or a town was conquered, the militias would immediately demolish its wells to prevent the inhabitants from returning. Illegal Jewish colonists still utilise this tactic to this day. The Israeli military, too, continued to use this strategy. In the Second Intifada, Israeli airplanes shelled the water supply of whichever village or refugee camp they planned to invade and subdue. During the Jenin Refugee Camp invasion and massacre of April 2002, the water supply for the camp was blown up before the soldiers moved into the camp from all directions, killing and wounding hundreds. Gaza remains the most extreme example of water-related collective punishment, to date. Not only is the water supply targeted during war but electric generators, which are used to purify the water, are often blown up by artillery from the sky. And until the decades-long siege is over, there is little hope to permanently repair either of these. It is now common knowledge that the Oslo Accord was a political disaster for Palestinians; less known, however, is how Oslo facilitated the ongoing inequality underway in the West Bank. The so-called Oslo II, or the Israel-Palestinian Interim Agreement of 1995, made Gaza a separate water sector from the West Bank, thus leaving the Strip to develop its own water sources located within its boundaries. With the siege and recurring wars, Gaza’s aquifers produce anywhere between 5-10 per cent of ‘drinking-quality water.’ According to American Near East Refugee Aid (Anera), 90 per cent of Gaza water (is) unfit for human consumption. Therefore, most Gazans subsist on sewage-polluted or untreated water. The West Bank should — at least theoretically — enjoy greater access to water than Gaza, yet, this is hardly the case. The West Bank’s largest water source is the Mountain Aquifer, which includes several basins: Northern, western and eastern. West Bankers’ access to these basins is restricted by Israel, which also denies them access to water from the Jordan River and to the Coastal Aquifer. Oslo II, which was meant to be a temporary arrangement until final status negotiations are concluded, enshrined the existing inequality by giving Palestinians less than a fifth of the amount of water enjoyed by Israel. But even that prejudicial agreement has not been respected, partly because a joint committee to resolve water issues gives Israel veto power over Palestinian demands. Practically, this translates into 100 per cent of all Israeli water projects receiving the go-ahead, including those in the illegal colonies, while nearly half of Palestinians’ needs are rejected. The irony is that Israel is now blaming the Palestinians for the Israeli company’s decision to cut off water. “The Palestinian Water Authority’s inability to set up additional water infrastructure in the West Bank ‘has led to the old and limited pipes being unable to transfer all the water needed in the region’,” RT quoted Israel Water Authority spokesman Uri Schor. But how is the Palestinians to develop a decaying infrastructure if every decision must be approved by the joint committee, which rarely grants Palestinian demands? The result of this impossible dichotomy is more suffering for ordinary people. “It should be no surprise that priority is given to Israeli colonies, while service to Palestinian towns is routinely reduced or cut off,” as is the case at the moment. With current summer temperatures in the West Bank reaching 38 degrees Celsius, entire families are reportedly living on as little as 2-3 litres per capita, per day. The problem is reaching catastrophic proportions. This time, the tragedy cannot be brushed aside, for the lives and well-being of entire communities are at stake. Het geloven in Zijn engelen. Het geloven in Zijn boeken. Het geloven in Zijn boodschappers. Het geloven in de laatste dag. Het geloven in het lot (al-qadr). Het geloven in Allah de meest Verhevene is het fundament van het geloof. De rest van de zuilen zijn gebaseerd op deze zuil. Het geloven in Allah houdt in dat we geloven dat Hij de Enige Schepper is, dat alleen Hij Degene is die voorziet, dat alleen Hij Degene is die doet leven en sterven en dat Hij Degene is die de volledige heerschappij heeft over het heelal. Niets gebeurt binnen Zijn heerschappij, enkel met Zijn wil. Het geloven in Allah houdt in dat we geloven dat Hij als Enige het recht heeft om aanbeden te worden en dat men zich met geen enkele aanbidding, zoals bv. de smeekbede, mag wenden tot iets of iemand anders dan Allah. We geloven dat alles wat naast Hem wordt aanbeden valsheid en bedrog is. Zo geloven wij dat Allah verheven is boven Zijn troon, boven de schepping op een manier die past bij Zijn grootsheid. En dat Hij met Zijn schepping is met Zijn kennis, hulp en steun. Het geloven in Allah houdt in dat we geloven in alles wat Allah ons heeft bericht over het onwaarneembare. We geloven dat Allah de meest Verhevene engelen heeft geschapen vanuit licht. Zij aanbidden Allah en zij zijn Hem nooit ongehoorzaam. We geloven in alles wat Allah heeft bericht over hen. We geloven specifiek in de engelen die bij naam zijn genoemd, zoals Jibriel, Mieka’iel en Israfiel. En we geloven in zijn algemeenheid in de engelen die niet bij naam zijn genoemd. Zo geloven we in alle taken waarmee zij zijn belast, zoals dat er engelen zijn die de ziel inblazen bij de embryo in de baarmoeder, engelen die de daden van de mens noteren, een engel die bij de dood de ziel neemt enz. We geloven dat Allah boeken heeft geopenbaard aan de boodschappers, middels de engel Jibriel, om deze te verkondigen aan hun volkeren. We geloven specifiek in de boeken die bij naam zijn genoemd, zoals de Thora, Bijbel en de Koran en we geloven in zijn algemeenheid in de boeken die niet bij naam zijn genoemd. We geloven dat de voorgaande boeken, zoals de Thora en de Bijbel, van tijdelijke aard waren als leiding in die tijd en dat ze niet onveranderd zijn gebleven. Allah heeft met het neer zenden van de Koran de voorgaande boeken opgeheven en deze is, omdat Allah waakt over de Koran, onveranderd gebleven en zal een leidraad voor de mensheid blijven tot aan de Dag des Oordeels. We geloven dat Allah de meest Verhevene boodschappers heeft verkozen vanuit de mensheid en middels de engel Jibriel aan heeft geopenbaard. Wij geloven in alle boodschappers die bij naam zijn genoemd, zoals Ibrahim, Moesa (Mozes), Iesa (Jezus) en Muhammed – vrede zij met hen – en we geloven in zijn algemeenheid in de boodschappers die niet bij naam zijn genoemd. We geloven dat Muhammed de laatste en beste der boodschappers is en dat er geen profeet na hem is gekomen of zal komen. We geloven dat Allah de meest Verhevene de schepping uit de dood zal doen opwekken op de Dag der Opstanding en dat zij afrekening zullen afleggen voor hun daden. We geloven in alles wat Allah en Zijn profeet hebben bericht over de zaken die betrekking hebben op het leven na de dood, zoals de genietingen en bestraffingen van het graf en alles wat zal plaatsvinden op de Dag der Opstanding. We geloven dat niets in deze wereld gebeurt, kleins of groots, enkel met de voorbeschikking van Allah. Allah heeft kennis van alle zaken, van wat is geweest en wat zal komen, en Hij heeft deze allemaal genoteerd in ‘het welbewaarde paneel’ waarin alles dat zal gebeuren tot aan de Dag der Opstanding geschreven staat. Niets gebeurt binnen Zijn heerschappij enkel met Zijn wil. Het geloven in deze zuilen brengt vele mooie vruchten met zich mee. Zo zorgt het geloven in Allah en zijn mooie namen en verheven eigenschappen dat je van Allah houdt en je hart alleen aan Hem aanhankelijk raakt. Hij die jou ziet en hoort. Hij die ervan houdt dat jij jouw vertrouwen in Hem stelt. Hij die van Zijn vrome dienaren houdt en hen bijstaat in al hun zaken. Het geloven in de engelen die met ons zijn en onze daden noteren, motiveert de gelovige om vele goede daden te verrichten omdat niets ervan verloren gaat en alles nauwkeurig wordt genoteerd. Het geloven in de boeken die Allah heeft neer gezonden en de boodschappers die hij heeft gestuurd, doet de gelovige beseffen hoe groot de ontferming van Allah is over Zijn schepping en dat Hij hen niet aan hun lot heeft overgelaten. Het geloof van de moslim in alle boeken en profeten toont het verschil met de andere godsdiensten, zoals het christendom en het jodendom, die de Koran en Muhammed verloochenen. Het geloof in de profeten is in de islam zonder nalatigheid en zonder overdrijven, in tegenstelling tot het christendom dat is gaan overdrijven m.b.t. Jezus en hem tot God of zoon van God heeft gemaakt – Verheven is Allah – en in tegenstelling tot het jodendom dat Jezus lastert en verloochent. Het geloven in de laatste dag waarop de afrekening voor onze daden zal plaatsvinden, wekt bij de gelovige angst op en maakt van hem een beter mens door onrecht in al haar vormen te laten. Het geloven in de voorbeschikking geeft de gelovige een enorme rust, door zich neer te leggen bij al datgene wat hem of zijn geliefden overkomt aan narigheid. Het geloven in de voorbeschikking en de krachtige overtuiging dat Allah niets laat gebeuren enkel met Zijn wijsheid, stelt de gelovige in staat om elke ramp te boven te komen. Ook is de gelovige wanneer hem het goede treft niet buitensporig blij en onder de indruk van zichzelf, omdat hij weet dat Allah Degene is die dit heeft voorbeschikt. We danken Allah de meest Verhevene voor dit prachtig geloof en vragen Hem om ons standvastigheid te schenken.